On the DL Deals Store, buyers can save 15% on a Avy Smart Speaker, powered by Android and Bluetooth. 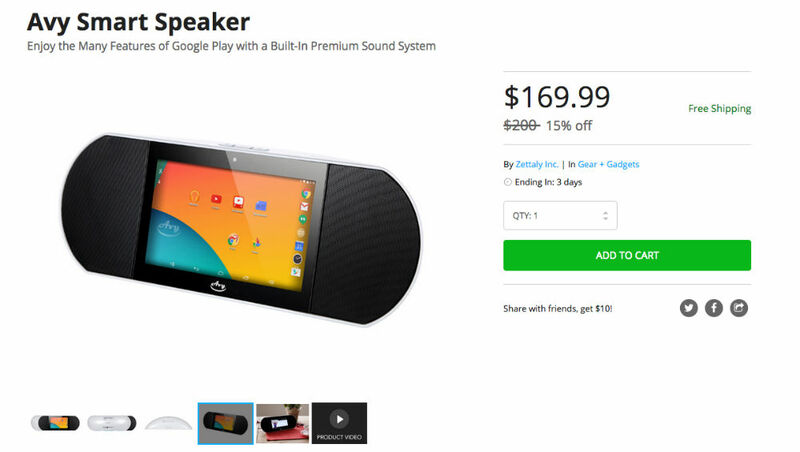 Priced at $170, down from its usual price of $200, this speaker features access to Google Play, allowing you to download all of your favorite music apps on a sound system that can handle them. Not only can you listen to music, but Netflix and YouTube is also supported, or any other app you can find needing speakers and a display. Imagine it being a tablet with really big speakers attached. Featuring a rechargeable battery, users can get up to 7 hours of audio playback on a single charge, but not only that, a front-facing camera and microphone are built-in, meaning you can Skype or video chat with whoever, directly through the device. Fancy. If this device interests you, follow the link below. Watch videos directly from Netflix, YouTube, etc.